Roofs in good condition are necessary to protect you and your family from harsh weather conditions. 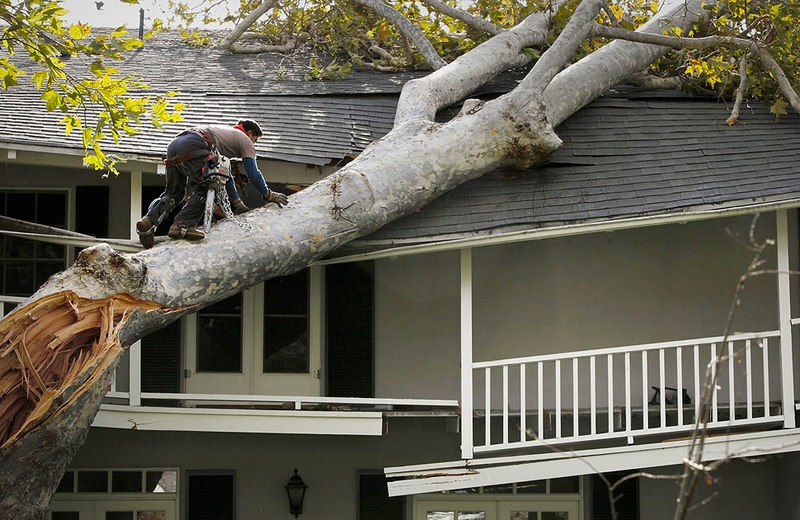 Imagine a situation where a tree fell on your roof in the middle of the night, what actions would you take to deal with the unexpected occurrence? How will you tell that your roof requires a repair? A compromised roofing system will allow the infiltration of water whenever it rains outside. You should consider going for a quick roof repair whenever the roofing system gets compromised unexpectedly. Another option is to use a protective cover on the damaged roof to prevent further damage to the roofing structure and property damage inside the house. The quickest way to salvage the situation involves tapping the hole in the damaged roof. When the weather passes, you can go ahead and look for a permanent solution to the damage. Another sign that indicates your roof requires repair is when shingles are missing. Missing shingles commonly occur after a massive storm or high winds. When you notice the shingles are curling and buckling, you should consider repairing your roof. The curling and buckling shingles are a sign of a damaged roof. It is advisable that you contact a licensed roofing contractor to find out if you qualify for a possible reimbursement. Calamities such as rain and high winds may also cause roof shingles to fall apart or miss in certain areas on the roof. Such cases are definite signs that your roof requires an immediate repair. A compromised roof valley may make you susceptible to roof leaks. Roofs get compromised by several factors including fire, animals, and inclement weather. Natural disasters are the key players when it comes to damaged roofs. High winds exceeding 50 mph have the capacity to temper with shingles from the roof exposing the substrate to other threats. Sharp objects such as tree limbs that are torn off trees will penetrate the structure and cause more destruction. A lightning strike also can tear the roof and form of a hole on the roof. Animals such as squirrels and Raccoons are fond of residing on the roof. The animals chew through the rotted wood which may lead to the formation of sizeable holes on the roof. Fire outbreak is capable of burning the whole roofing system into ashes. The measures adopted by the roofer depends on the timing of the call. For example, when you call the roofers in the middle of a storm, they will have to wait until the storm subsides. Immediately the wind calms down, the roofers will be dispatched to your place of residence without any further delays. Torrential rains and high winds make it difficult to repair a damaged roof. Roofs that are damaged by fire outbreak can be mobilized to get back to its normal condition. Accessing all areas of a roof that has been damaged by fire can be difficult because fires interfere with the structural integrity of the roofing system. In such cases, the safety of the roofing experts, as well as the homeowners, is prioritized. The first thing is to remain calm and relaxed. Instead of panicking, you should contact the roofing experts for assistance. Ensure to contact professional roofing contractors to avoid being conned by storm chasers who want take advantage of your fears. You can also visit Angie’s List to get references of certified roofing contractors. You should also remember to contact your insurance company for possible compensation. Once the roof has been secured and protected from further damages, take the time to think through the repair or replacement options available. It is not recommendable to fix the roof on your own. You may end up injuring yourself or even worsening the damage. You do not have the professional skills to assess the actual damage and come up with a long lasting solution. It is also advisable to document the loss encountered in writing and with photos. https://knoxvillesroofing.com/wp-content/uploads/2016/09/KNoxville-Emergency-Roof-Repair.jpg 631 970 Eric Keith https://knoxvillesroofing.com/wp-content/uploads/2015/03/Knoxvilles-Roofing1-300x195.png Eric Keith2016-09-12 12:53:092016-11-14 16:40:36How to Handle a Roof Emergency?